Little Baby Hayden was turning 100 days old and, as part of traditional Korean custom, they celebrate this milestone with a special Party where they introduce the Baby to friends and family. 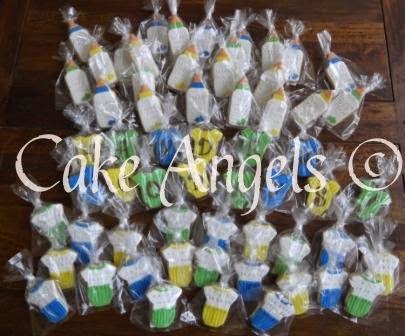 The Cake Angels baked and decorated 60 Cookies in the shape of Baby Onesies and Baby Bottles in colours Yellow, Blue, Green and White. 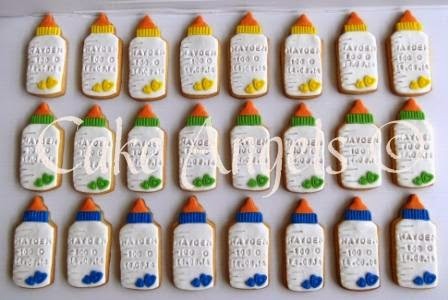 The Baby's date of birth was imprinted on the Cookies, along with his initials and 100 Days. Then his name and the words '100 Days' were spelt out in large letters on some more Baby Onesie Cookies to be used as the centrepiece at the Party. Wishing you a long, happy and healthy life, Hayden, from the Cake Angels. Thanks for making these wonderful Cookies for Hayden's 100 Days Celebration. We absolutely adored them and all our guests couldn't resist - they wanted more! They were so delicious and beautifully crafted. We will definitely be looking to order again in the future and would recommend you to everyone else! Thanks for your quick response and catering to our design requests made the day even more special with your Cookies!